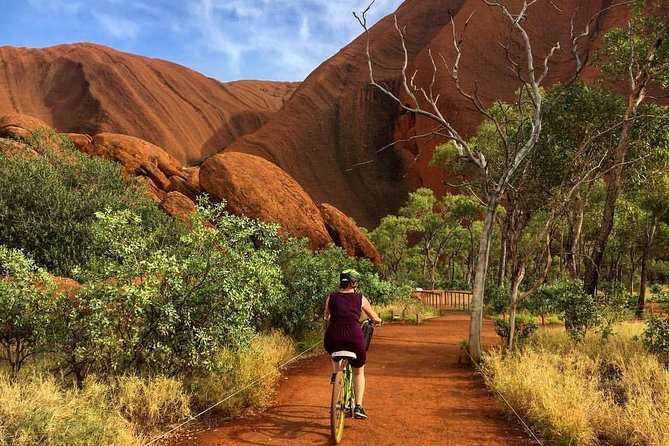 Cycle around the base of Uluru at your own pace and in your own time. The 15-kilometre self-guided cycle journey is easily achieved in under three hours with plenty of time to stop and explore the beauty of the spiritual and unique wonder of the world: Uluru. Experience a personal connection to the sacred Aboriginal land whilst stopping to observe historic rock art and wondrous waterholes. With options for everyone, the whole family can ride around the base of Uluru, getting you up close to the amazing sandstone monolith! If you don't have your own transport, the Bus n' Bike package is perfect for you. Ensure you bring plenty of water, sunscreen and appropriate clothing for bicycle riding, and most importantly... your camera! • Uluru Bike Hire 3-hour bike hire from the Cultural Centre. Adult bikes, kids bikes, tag-alongs and toddler seats are available. Hire cost includes bike and helmet for the 3-hour session. • Uluru Bus n' BikeApprox 4.5-hour duration. Pick up and drop off from 5 locations around the resort, transport to the Cultural Centre (Park entry fees are payable, and not included in the product/ticket price), bike hire and helmet. This is a recommended guide. Children are still encouraged to test their seat, tag-along- or bike before riding. Townie Bikes Over 145 cm. If you have a child over the height of 145cm, please ensure an adult booking is made. Comfortable bikes, and a great way to get around the rock.